In this first Darla King novel, Darla returns to square dancing in midlife following tragedies in both her personal and professional lives. She moves from Florida to Texas and from high-powered investigator to life in a small town and a job as far removed from crime as she can think of—she becomes a square dance caller. But when an unconscious stranger turns up on the ranch of one of her dance club members, her specialized knowledge may hold the key to the identity of his assailants. At first, Darla is concerned that her friend Doug is the target. When the same square dancer is assaulted not once but twice, she realizes something else is wrong. Even more telling is the secretive but disturbingly handsome FBI agent that enters the picture. Darla didn’t plan it this way, but her curiosity pulls her into the case and she has to use the investigative skills from her past that she thought she’d left behind. She’s inquisitive by nature, and looks for patterns to unravel it all. Patterns like the ones she uses to choreograph a dance. Combined with her contacts as a square dance caller and her square dance knowledge, she’s just the person to fit all the pieces fit together. Darla, along with her close friends from the Clearton Squares Dance Club, ends up in the thick of things—and in danger. Rosalee Richland is the pen name of two real-life square dancing writers. As Rosalee, co-authors Cyndi Riccio and Rhonda Brinkmann joined forces to create the Darla King cozy mystery series. Darla and her friends portray the best of the square community, the warmth and friendship among people in it, and the enjoyment square dancing brings worldwide. Darla’s curiosity often puts her squarely in the midst of unusual circumstances, and Darla can’t let go until the mystery is solved. When not writing, Darla’s co-authors enjoy reading, traveling, meeting readers and fans, networking with other authors, and – of course – square dancing. They are learning to blog, and are always working on Darla’s next mystery. If you have a chance, stop in at a book signing and find out which half of Rosalee shows up! In the meantime you can stay in touch with Rosalee and Darla on on Facebook, Goodreads, or the Darla King Series blog. Or just search for “Rosalee Richland” anywhere in cyberspace. Recently widowed, Darla has left a career as a Florida criminal investigator and moved to Texas to work as a square dance caller. She is cautiously beginning a relationship with Doug, a fellow square dancer. When Doug discovers an unconscious man dressed in square dance clothes on his property, Darla and her new friends search for answers regarding the attack. 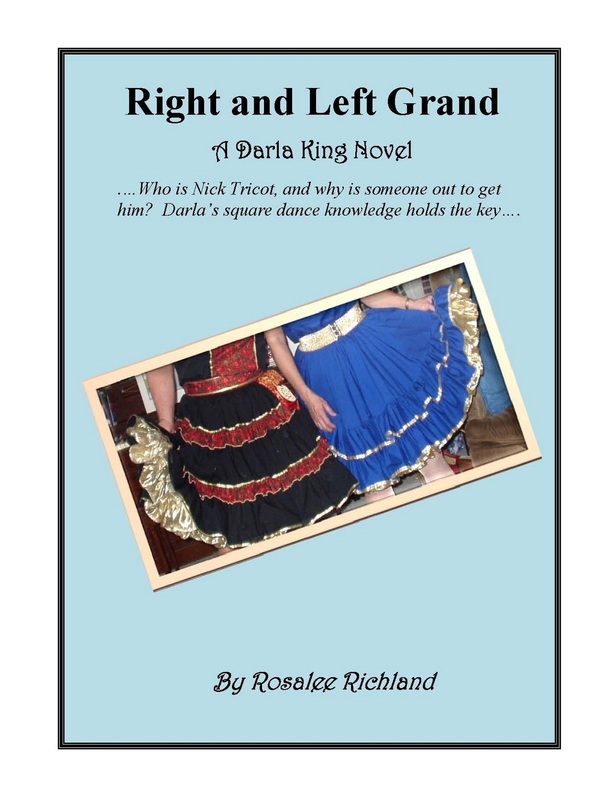 Right and Left Grand is the first in the new Darla King series by Rosalee Richland. This cozy mystery is perfect for anyone interested in square dancing, as it is full of details about the costumes and the dance calls. The story is told entirely from Darla’s point of view, giving the reader insight to her inner thoughts. I would have liked more background on Darla’s past life, as well as her relationship with Doug. It was nice to read of a mature couple taking a second chance at love, and approaching it with caution. Their nervous steps toward intensifying the relationship was more realistic than most novels. This fresh new setting for cozy mystery lovers should keep readers engaged throughout the series. I received this book from Great Escapes Book Tours book bloggers program to read and review. I was not required to write a positive review. The opinions I have expressed are my own. I am disclosing this in accordance with the Federal Trade Commission’s 16 CFR, Part 55. This entry was posted in Uncategorized on September 6, 2013 by theselftaughtcook. Thank you for hosting Right and Left Grand!! !